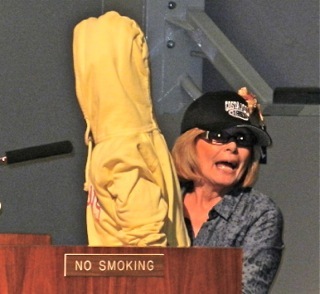 Tuesday night what should have been a very short Costa Mesa City Council meeting stretched out to nearly double the length of time it should have taken. It began a half-hour late because the council was delayed in their closed session - probably talking about the negotiations that took place with the Costa Mesa City Employees Association (CMCEA) earlier in the day. Read Brad Zint's coverage HERE. When it finally got started Mayor Jim Righeimer presented his Mayor's Award to Randy Garell, President of The Grant Boys store on Newport Blvd. The store has served the community for decades and is one of the oldest remaining businesses in the old Downtown area. 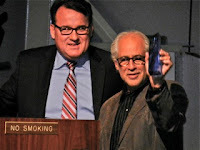 Garell is shown here with the award given to him by Righeimer. 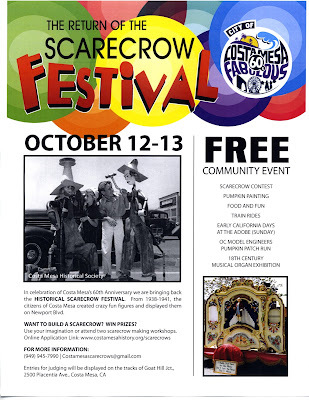 Then 60th Anniversary Committee member Charlene Ashendorf made a pitch for the upcoming Scarecrow Festival on October 12th and 13th. The community is invited to participate in the creation of scarecrows, which will be displayed at Goathill Junction - the model train venue at Fairview Park. Classes will be held to train folks on how to create scarecrows. 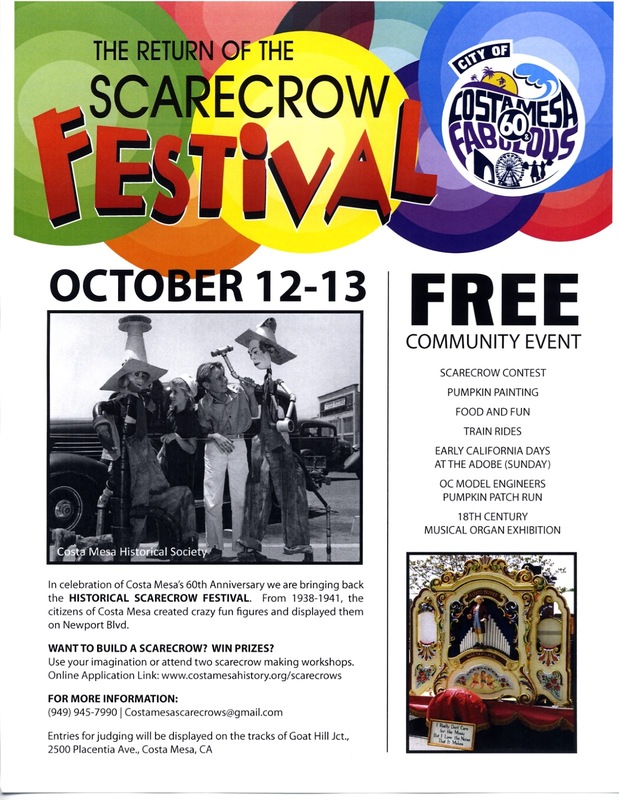 See the following flyer (click on the image to enlarge) on the event and/or visit their website at http://www.costamesahistory.org/scarecrow.htm. During Public Comments, along about 7:30, several people rose to speak on a variety of issues, but the first one out of the chute was Sue Lester, a member of the 60th Anniversary Committee, who expressed concern that city policies may have been violated and no accounting of the finances of the 3-day celebration in June has yet been made. She also was concerned about the survey form distributed to the volunteers, indicating that it was much to complicated. Other speakers expressed concern for the future of Fairview Park, including the model trains, and Robin Leffler complained that the Finance Advisory Committee had recently given short shrift to the consideration of a modification of the Business License Tax. Jennifer Muir, representing the CMCEA, mentioned the current negotiations and introduced the council and audience to the new web site recently created to keep the public informed about the negotiations, HERE. 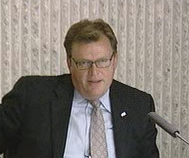 During Council Member Comments Gary Monahan actually participated again for the second meeting in a row. 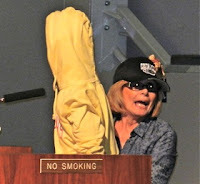 He brought with him a "show and tell" item - a tri-fold document that looked from the audience vantage point like a restaurant menu, but was, in fact, the City of Costa Mesa budget for the 1965-1966 year. He read some of the entries. 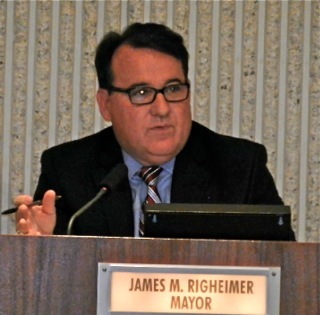 Righeimer went to great lengths to compliment himself for two successful "Meet the Mayor" events within the past couple weeks. He indicated that he hoped to hold more of them in residents homes, so folks could just walk a couple blocks to hear him speak. Humility has never been one of his strengths. As he told us about the concern expressed by some Eastside neighbors about the proliferation of rehab homes around town, he mentioned that the previously-discussed Nuisance Ordinance was being re-vamped and a streamlined version would be presented to the council at the September 3rd meeting. He also mentioned a "Registration" policy, that theoretically would permit city officials to do a headcount at unlicensed group homes, so we could keep track of who lived there. When I heard that I got just a little nervous, since unlicensed group homes - those with six or fewer "clients" - are treated just as any other family home in our city. I found myself wondering if this "Registration" scheme might unleash Code Enforcement staffers who may begin pounding on doors throughout the city. It smelled very much like the Gestapo to me. I hope the contract legal firm does a good job of vetting this situation before we find ourselves in yet another legal quagmire. 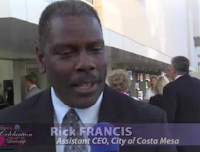 Steve Mensinger complimented the Costa Mesa Foundation, a member of which spoke earlier to report on the success of the Concerts In The Park series this summer, and asked Assistant CEO Rick Francis - substituting for the vacationing CEO Tom Hatch - to ask two other community organizations to present before the council on September 3rd, too. He also addressed the concern one speaker had about Lions Park and a specific event there recently when a city staffer was attacked by a deranged homeless person. Mensinger said he drives by the park every day - he's just got to get a job one of these days. 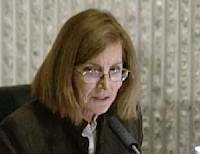 Sandra Genis also thanked the Costa Mesa Foundation and then expressed concern for the conflicting schedules for upcoming important meetings. It seems that the next General Plan meeting and the Fairview Park Citizen's Advisory Committee are both scheduled to meet at the same time. She was also concerned about "steps" that had been carved out of a hill at Fairview Park. 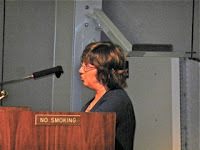 Wendy Leece had a long laundry list of items, including the Concerts In The Park; the conditions at Lions Park (she suggested consideration be given to providing "greeters" at the park to manage the homeless folks); the meeting schedule conflict (she suggested moving the Fairview Park Committee meeting); the broader homelessness problem and the role the folks of the Churches Consortium are playing and, finally, she recognized outgoing Finance and Information Technology Director, Bobby Young, for his dedication and professionalism and service to the City as he departs for the private sector on August 23rd. Last night was his final City Council meeting - and it will be one to remember. More on that later. Francis, standing in for Hatch, reported that the recruitment process for a new permanent Fire Chief is moving along and that Hatch will very likely make his decision upon his return from vacation later this month. He also expanded on the issue of the Lions Park attack by the homeless person. He told us Vanguard University - next door neighbors at City Hall - has a new President. Francis also mentioned the General Plan Workshop coming up, and indicated this one will include a puppet show for the children and refreshments by Starbucks. And, he also acknowledged Bobby Young and mentioned that they will be splitting off the Information Technology segment of his job and will be looking for two people to replace him - one in Finance and one in IT. I thought that was VERY interesting. They finally got to the Consent Calendar and three items were pulled for separate discussion. 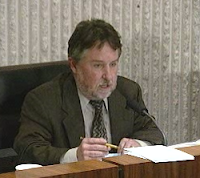 Gary Monahan pulled item #6, the reimbursement of the appeal fee for the Catalina Shores Homeowners Association. After a short discussion it was approved, 4-1, with Monahan voting NO. 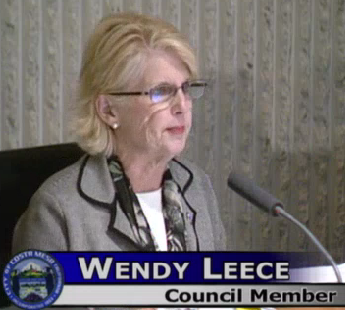 Wendy Leece pulled Item #7, the request for the use of grant funds to design traffic calming measures for East 19th Street similar to those installed last year on Broadway. There was significant discussion on this issue, ranging from the lack of data on the Broadway project to measure its effectiveness to our ability to install such measures on 19th Street because it's on the Master Plan of Highways. During the discussion comments were made about the narrowness of the streets at the corners, with some speakers concerned about the safety of navigating around them. Righeimer, in fact, admitted he had scuffed a planter or two while driving around the area. 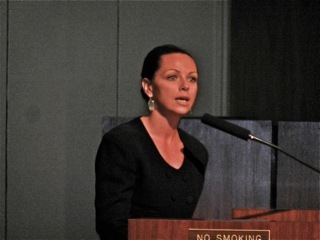 Several Eastside residents rose to speak favorably about the Broadway project, including Syndy Neyland, a member of the Eastside Costa Mesa Neighbors Group, who praised the new beauty of the street, the quiet they now experience due to the rubberized pavement and the safety of the street. Realtor Jeff McConville, President of that group and a resident of East 19th Street, also spoke in favor of the plan, but expressed concern that there should be something planned to preclude the traffic form squeezing over into neighboring streets - like Magnolia, Flower and 18th Street. Eventually the item passed, 5-0. Then came the most interesting, and frustrating, item of the evening - Item #9, the purchase of 435 new computers for use throughout the city. Keep in mind that this council had previously approved this item back in May and the only reason it was back before them is because the successful vendor back then had neglected to include sales tax in his bid. He refused to work with the city on the issue, so staff brought the item back with a different successful bidders numbers - slightly more than the previous bid. What happened then was like something out of Alice in Wonderland. It was though we'd had a time warp and the council was re-hashing the entire concept again, not just the new bid. Monahan said he didn't understand why we should replace all the computers at one time, even though this whole thing was explained back in May. Mensinger suggested that we go back and get computers that included touch screen technology, even though Young explained to the council that the use of touch screens is much less efficient than the standard keyboards. And round and round it went, even discussing which operating system should be used, even though the staff had used a consultant to help identify the specific systems that would work best for the City. Council members were concerned about buying "obsolete" equipment, even though most of the computers being replaced are 10 years old - that's several lifetimes in computer years. Francis intervened, attempting to help the council to understand the methodology that went into making the decision and the hours of staff and consultant time that was spent sorting this all out. Again, this was all discussed in May. The council has previously budgeted a complete overhaul of the network backbone throughout all city operations and this new batch of computers will facilitate the installation of that infrastructure. There seemed to be a major disconnect with the male members of the council on this issue. The deal was doomed when Righeimer said he'd had some misgivings over the past couple weeks, but he didn't articulate what those misgivings were. That was straight out of the old Allan Mansoor playbook and it seemed VERY peculiar. It made me wonder if he might have a buddy in the computer business that needs a job. Sorry, but his performance in the past makes me suspicious of his motives. So, after all that micro-managing discussion - and in a final slap in the face to Bobby Young on his way out the door - the council voted, 2-3, to not move forward with the purchase. I don't have to tell you who voted which way. So, it's back to the old drawing board for whomever is left on the staff to worry about it. The meeting finally adjourned at 9:00, making it too late for any of us who wished to dash over to the National Night Out celebration at the Target parking lot. I did end my evening at City Hall with a chuckle, though. As I sat in my car getting ready to depart I noticed Righeimer driving out of the parking lot and bounce his car over one of the curbs marking a parking spot. And I didn't even see him with a Diet Coke all evening! It just seemed somehow appropriate for the evening. The next council meeting is September 3rd - the day following the long Labor Day holiday weekend. So it will take two to replace Bobby Young, huh? We're going to have to add a wing to the city hall in order to hold all the employees that Riggy seems to think we need. Man, half the city will be working for his "government" if he doesn't quit. I would also like to see the finances from the 60th event. There should be bids available to see and how the final selection was made. Why is it taking so long to make them available? I hope the hiring for a new finance and technology manager includes testing with the top scores being asked back for an interview by an outside panel and anyone with ties to applicants excusing themselves from the hiring decision. Residents deserve qualified people in charge of their tax dollars. Terry, thanks. Fixed it. I took that earlier link right from the flyer! Yikes! You may recall that we had a separate IT Manager position until it was combined with the Finance Director a few years ago. Many of us thought that was a strange move (no offense to Bobby Young; it was an organizational and workload concern). Now, they appear to be going back to what really makes sense. 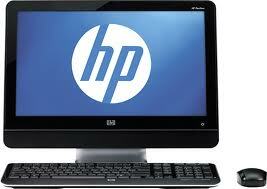 I think it's a good move..
No reason at all on replacing computers that run Windows 2000? None? 1) Though I appreciate the issue with the rehab houses and the problems they cause for neighbors, Mr. Righeimer seemed to indicate that they were looking into a plan wherein the houses had to register the patients with the city. That seems to be a HIPPA violation. When ordered by a medical doctor, rehab is considered medical care. I chuckled when Mr. Mensinger asked if staff had considered tablets and iPads. An iPad is not a computer and most Apple products (of which I am an avid user) are not set up for enterprise solution software. As for touch screens - look at how many key boards are sold for iPads. It's neither an efficient or ergonomic solution. But, I was appreciative of Ms. Leece's well-considered questions which gave Mr. Francis a chance to explain to the audience, who seemed to be listening more than the council was, that they had used a consultant, that they had looked into all the variables and that they had made a reasoned decision. My impression was that someone was whispering in their collective ears about having the best, shiniest new toy. Ms. Leece made a great point when she called them blithely spending money for unnecessary lights at Fairview Park and then dickering about this. sk, would that be like 4 CMSD Board members using ratepayer dollars to personally sue another Board member who was asking inconvenient questions so they could put their buddy, who lost an election to the new guy, back on the Board? You don't think CMSD ratepayers deserve qualified people in charge of their tax dollars? On another front: We've not really heard anything from Rick Francis before tonight. The man is a jewel! It would make good sense to fire Hatch (a hole into a hold) and put Rick in the city manager position. He's articulate, stays on point, and what he says comes out in sentences of well under sixty words; I've never heard hatch come in under a hundred fifty. Maybe the man'll find something to do in Costa Rica that will put Rick in the head spot. One can hope. Man, I like that thought Terry. Couldn't agree more. Did you see the big fat lie Mensinger told on the "Fairview Park Friends" page on facebook? He said the council put that trail in the field. No IT WASN'T THE COUNCIL, IT WAS STEVE. Now he lies about it. inconvenient truth, I still have that one room garage rental, anytime you're ready! So, Costa Mesa's 54 unlicensed rehabs will soon be required to complete a "Rig-istration" form with the City so we can keep track of all their sketchy "residents". Okay, but will this new official City document ever be made easily available to the concerned Public upon request through A+ Municipal Transparency? I'm sure that most CM parents, as well as potential homebuyers would want to know who lives right next door to them in their "family-oriented" neighborhood, even if it's only for just a temporary "visit". Apparently, the State strongly believes that rehab patients "benefit" more from their counselors supervised "medical" treatments via "mainstreaming" recovering addicts into residential neighborhoods instead of overly "clinical" specialized hospitals by directly providing a much more "realistic" life setting & more challenging social situation from which patients can draw upon. Okay...? Soooo, just how are we good "clean" neighbors "benefiting" from all the State's contrived, mandated, & enforced "community-based social interactions" with their chain-smoking, noisy-guttermouthed, yet considered only "temporary medical patients" which are adversely affecting OUR "real-life setting & situation" (e.g. horrendous air quality, no longer able to enjoy a peaceful & quiet home life, as well as, drastically lowering our once highly-desirable neighborhood's property values)? Unfortunately, many Costa Mesa residents cannot exercise a simple personal choice (i.e. to willfully disassociate with drug and alcohol addicts in our immediate lives) due to the fact the State of California insists that we must live amongst significant groups of "recovering addicts" at a time, as well as, providing opportunities for multiple "group homes" to legally operate within our once peaceful "residential" neighborhoods. 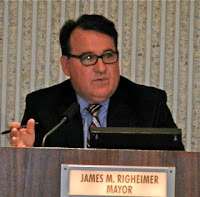 So I really hope that our former CM Mayor and current CA State Assemblyman, Alan Mansoor, will introduce some legislation to address the fact that Costa Mesa residents are living with most of the rehabs in Orange County (i.e. 1 out of 4 rehabs). And he should collaborate with his pals in Sacramento to work towards revising the current CA Rehab Laws. So as to further promote longtime CM "residential" homeowners rights over these highly lucrative "group homes" which are just nuisance "commercial-businesses" legally allowed to operate within our City's "designated R-1" neighborhoods. That whole little piece of theater about the computers? Did it look like a rehearsed one act play to anyone else? Three actors had the script, Jimmy was almost convincing; oh the torture, oh the agony of trying to decide what to do! Oh what am I saying? Any pre- meeting collaboration by the boyz would be a Brown Act violation and of course these guys wouldn't do that, would they? Privatizing mental health services in CA wasn't such a great idea, was it? How much of our city is affected by this bad decision? In addition to the private rehabs for profit, we have people who are homeless in need of in patient care. incovenient truths - two totally different topics and you know it. And you know who took advantage of that situation for as long as they could. There are pedophiles in those rehab homes. They aren't accepted in other places. But they a there as no background check is made, only cash up front every month. This is what Costa Mesans live with. And Rigggy is unable to doa thing about it except talk. Mean people get what’s coming to them, as the pet troll knows and fears in his blackening heart.